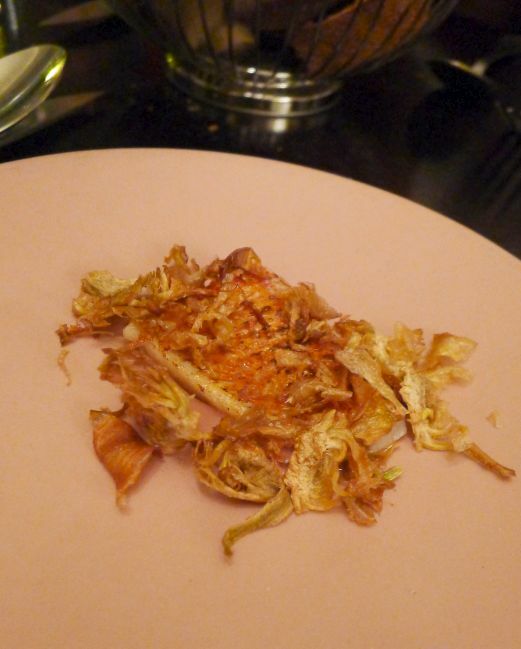 Le Chateaubrianad has been on my radar since I watched an episode of "No reservations" where Tony Bourdain and Eric Ripert (from Le Bernadin) called the Basque chef, Iñaki Aizpitarte, a “genius” and said he wished he had the idea to create dishes that were served. 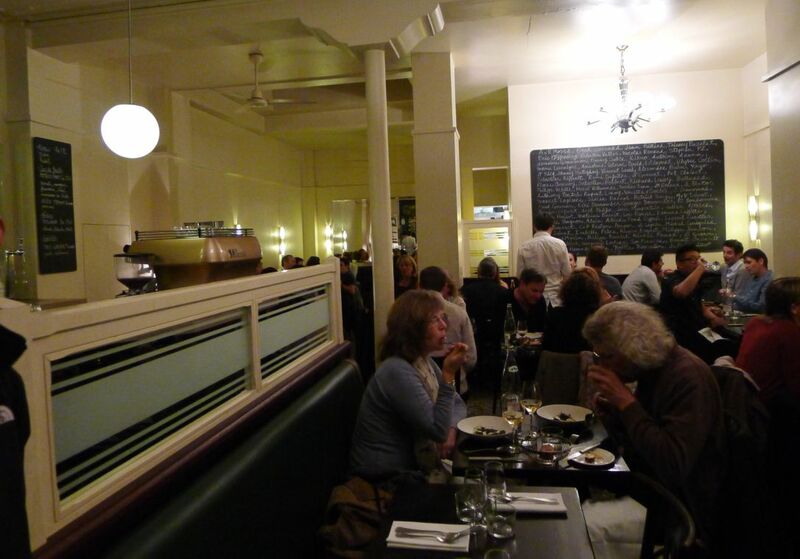 Le Chateaubriand opened its door in 2006 and soon became a leading figure in what has been dubbed the city’s ‘bistronomie’ movement, which saw a new generation of bistros abandon starched tablecloths and uptight service in favor of a more relaxed approach, with affordable prices to match. Two seatings are available: the first one is by reservation, two weeks in advance and the second is walk-in only. Reservations are so difficult to get as they only take calls from 3:00PM to 7:00PM. Be prepare to call numerous time before somebody will pick the phone. I called at least 10 times and almost gave up but luckily Hoa took over for me and to our surprise somebody picked up the phone. The only time they can take us is at 9:00PM which is quite late but I was so happy to score a reservation that I quickly accepted anyway. 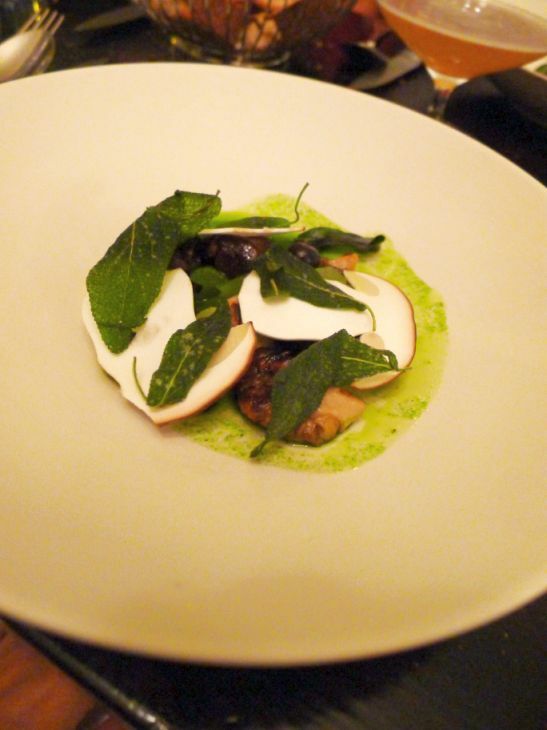 Le Chateaubriand offers only a chef's tasting menu; the cuisine is modern and innovative, with a wide variety of ingredients that will almost definitely include meat, maybe offal, raw fish, and seasonal ingredients. There are no substitutions so if you are a picky eaters, or with various dietary restrictions than Le Chateaubriand is not for you. 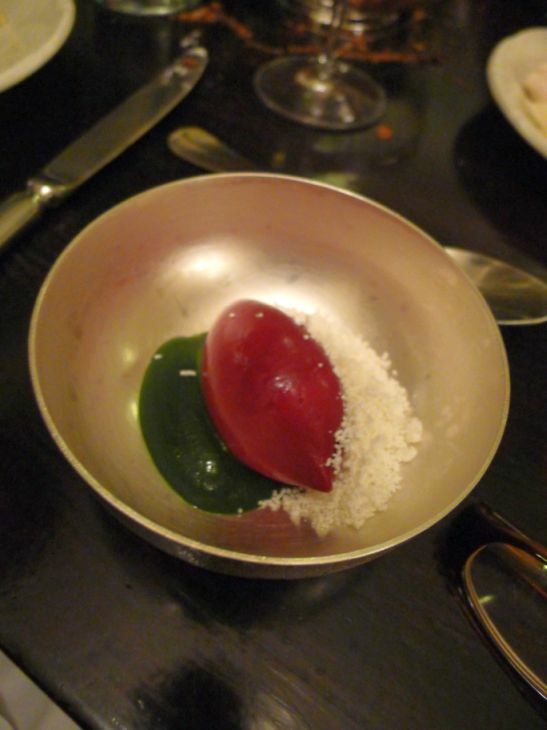 While the restaurant doesn’t have a Michelin star, Le Chateaubriand is currently ranked #22 in the "World's best 50 restaurants" higher than many other 3 Michelin stars prestigious establishments in Paris such as Alain Ducasse au Plaza Athenee, and L’Astrance, even surpassing the French Laundry which is now ranked at #50. Personally I don't think it is in the same league with the French Laundry but that's just my experience dining at both restaurants. 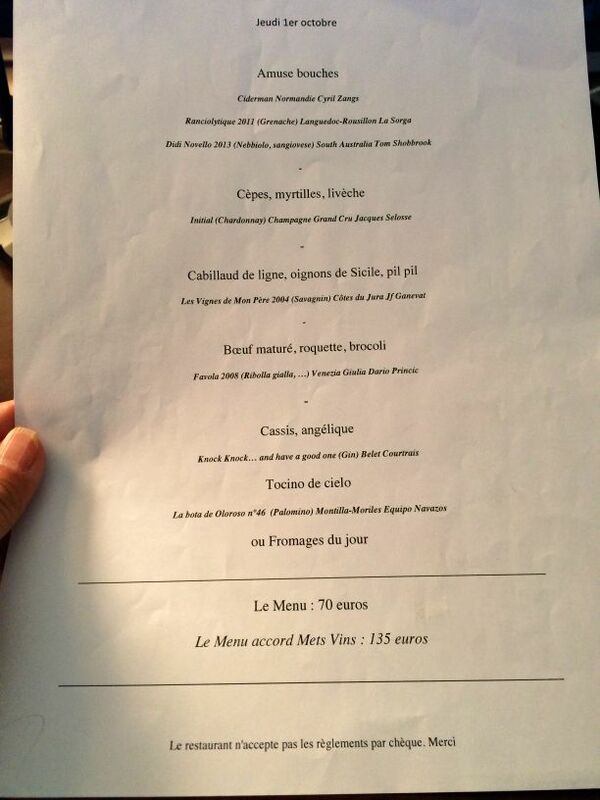 However at 70 euros per person for the tasting menu at a "world's best" restaurant, as opposed to several hundred, is a major steal. 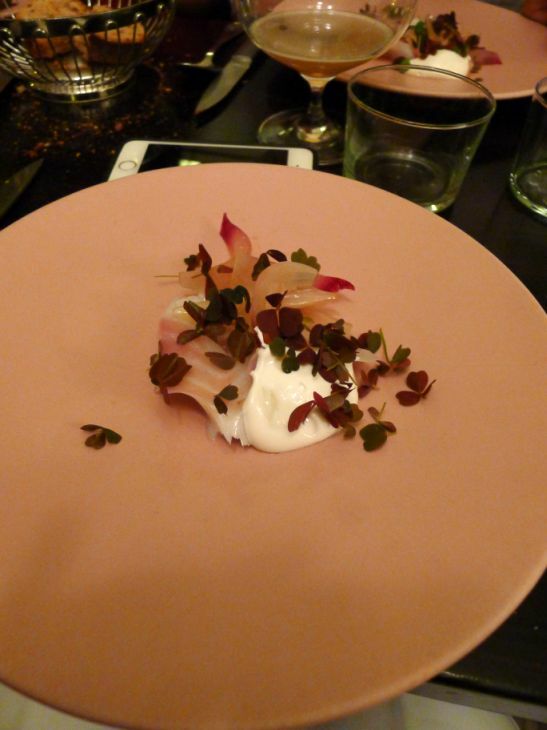 The tasting menu changes daily, depending on whatever Chef Inaki Aizpitarte comes up with that day and also depending on the availability of seasonal ingredients. 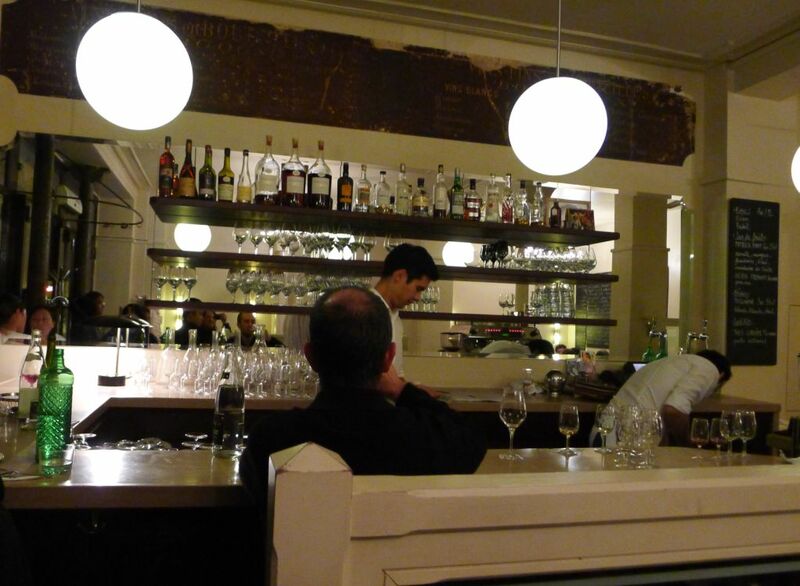 The restaurant is located in the 11th arrondissement in Paris and sits on a busy section of avenue Parmentier. As soon as you walk in, you see a large intimate dinning room with unadorned white walls and simple wood furniture. Tables are set up really close together that you can eavesdrop on the tables surrounding you, there’s a relaxed and fuss free air about the restaurant. 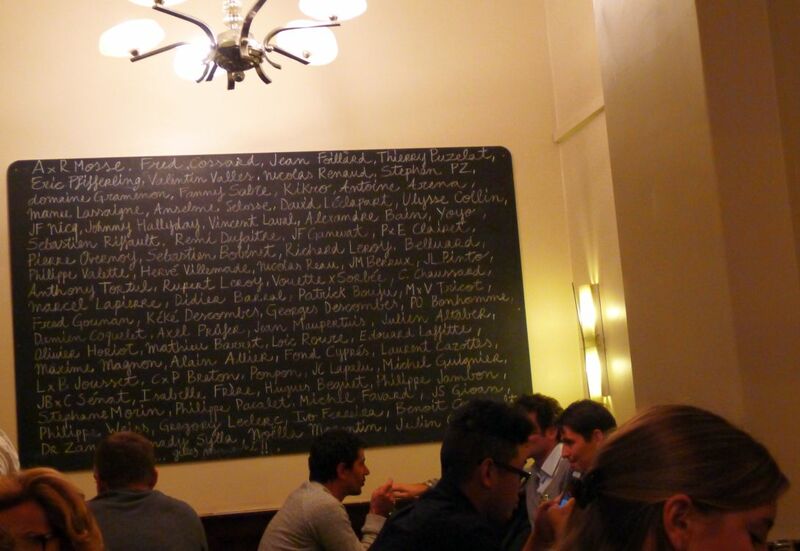 A large chalk board with hand written name of the vineyards and available by the glass. The bar is located on the left as soon as you walk in. Simple white napkins, wooden table and really no frills. The restaurant gives off the impression of a local neighborhood joint rather than an internationally-recognized eatery. 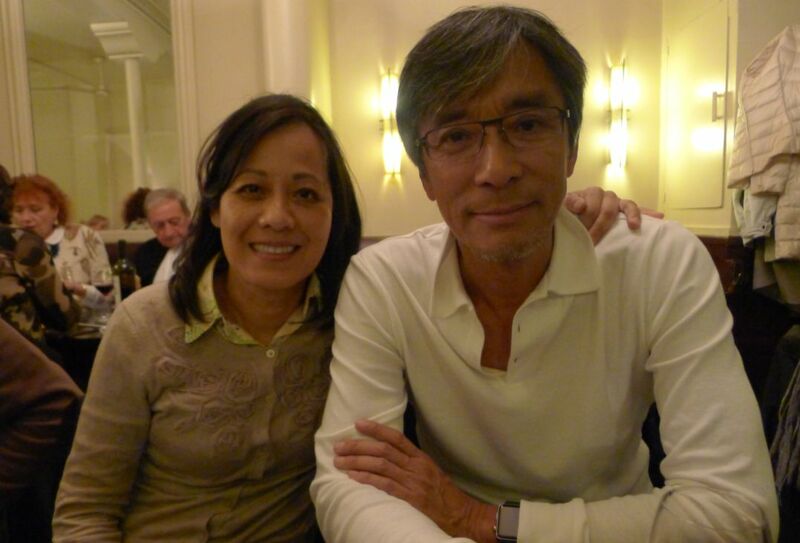 Our reservation was at 9:00PM and we were seated right away right at the entrance next to the bar. The restaurant was full by 9:00PM and there were a lot of people without a reservation staying in line in the hope of getting in. We finished our dinner around 11:30PM and we a bunch of people getting in for their meal and our estimate is they will not be done before 1:20AM... That's just crazy! 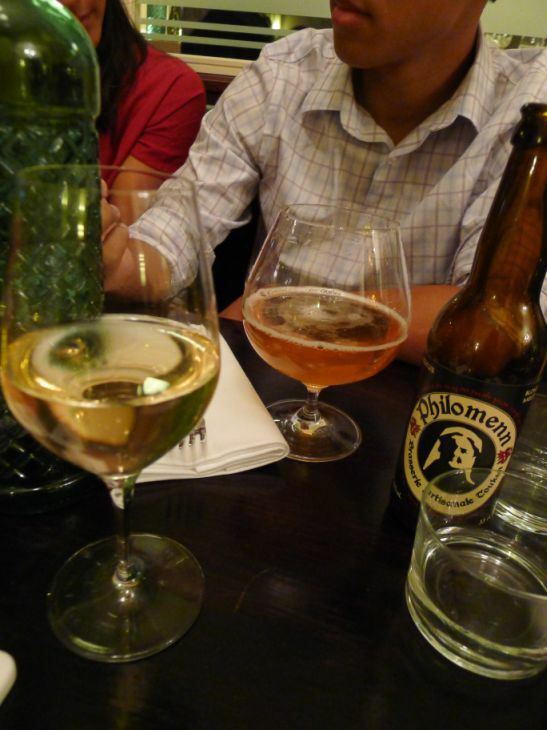 Hoa ordered some white wine to start and Kevin ordered a beer. 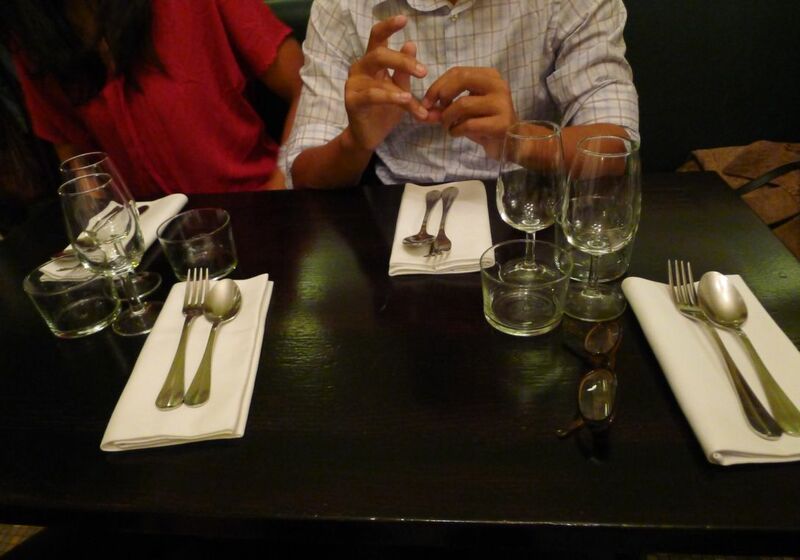 The menu was not given out until the end of our meal as we told our waitress to surprise us with the meal. 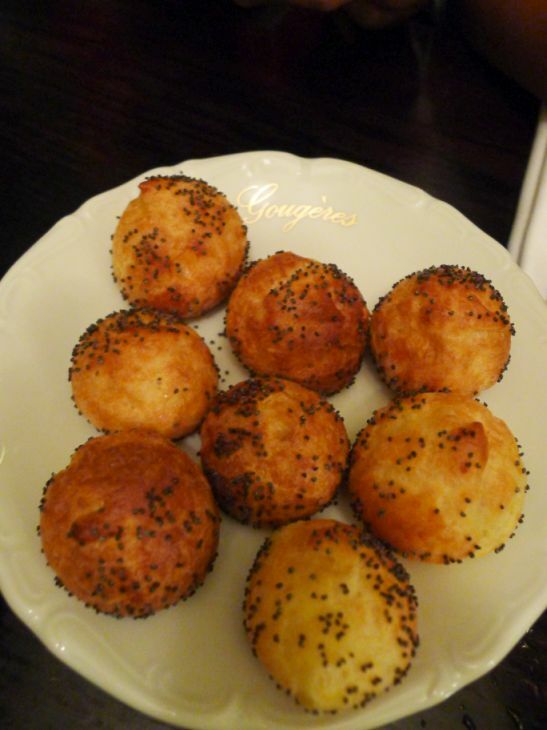 The first amuse bouche is a plate of gougeres (Cheese puffs) with poppy seeds. 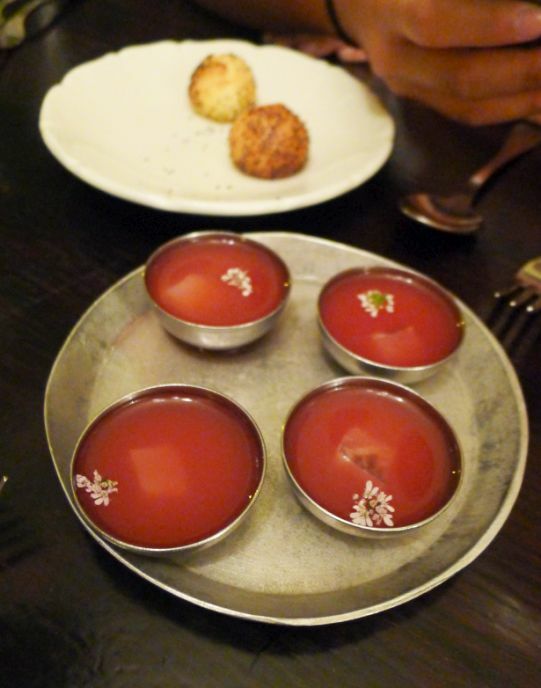 This is a typical French amuse bouche, warm and lightly cheesy that is perfect with a glass of wine to start the meal. A delicious broth, nice balance with citrus juice. Also beautiful to look at. 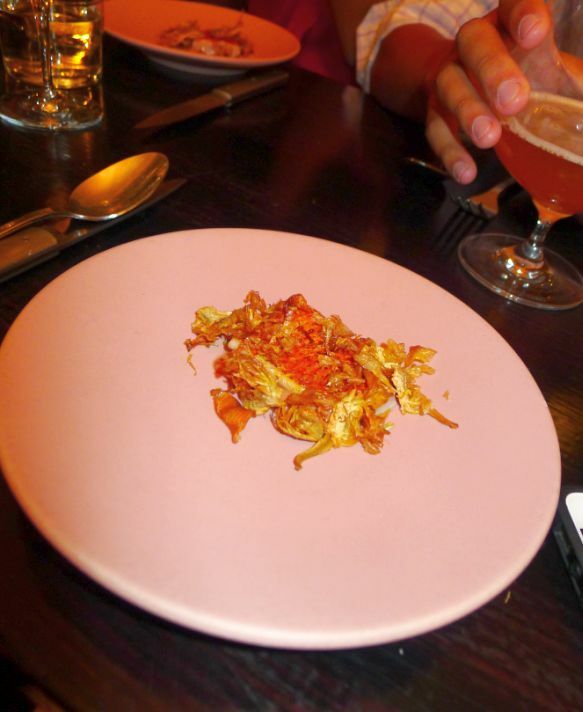 The last amuse bouche is a fried small shrimps with passion fruit powder. Absolutely delicious! 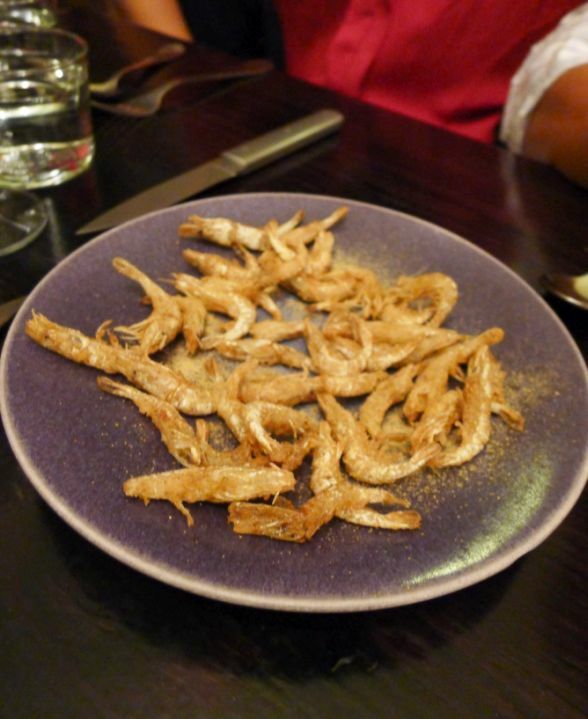 Tiny sweet shrimps, lightly battered and deep fried, served with a dusting of passion fruit powder. This dish has an Asian flair but the shrimps were crispy, sweet delicious and the passion fruit powder enhanced the flavor of the dish. 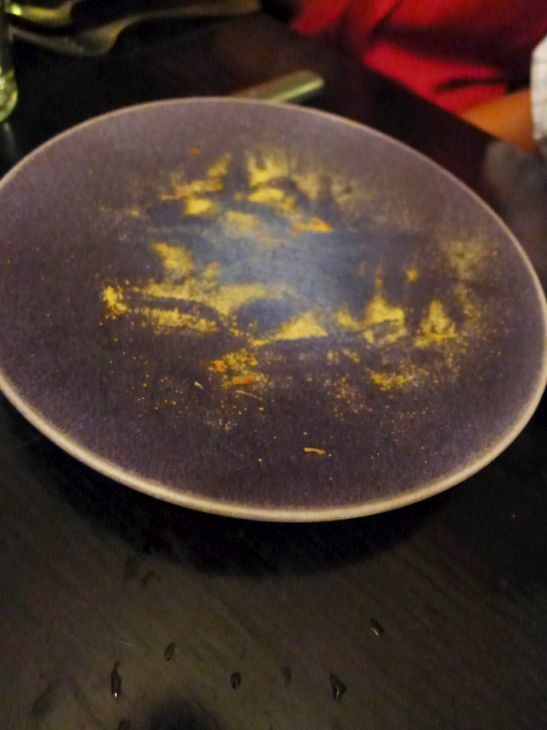 I cannot remember what dish was made with. All I knew is it was delectable and we ate it all. 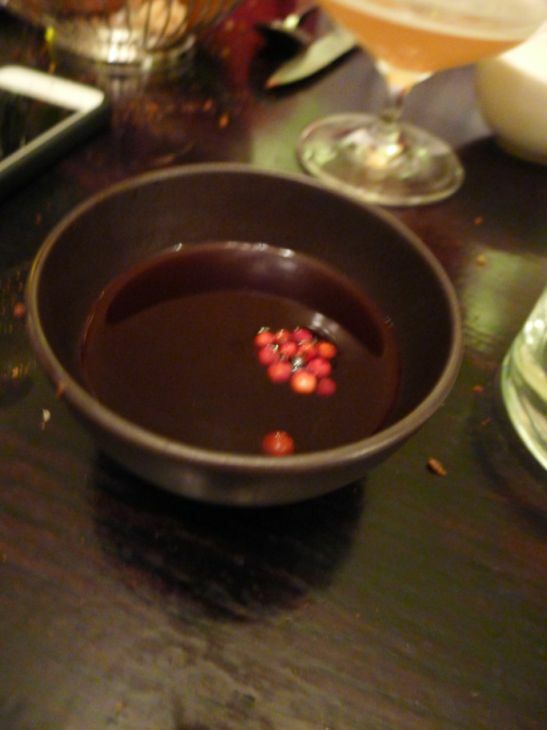 The next course is a beet broth that I really did not care for. I tasted pretty weird to me, a bit acidic with a savory broth, very forgetful. Oh my god this dish was incredible! this is a vegetarian dish but it was so delicious. 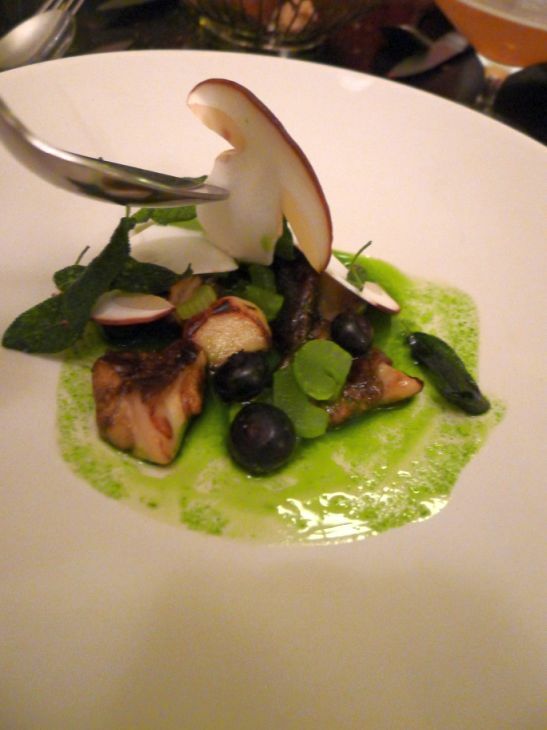 The combination of raw mushrooms, seared mushrooms, crunchy fried sage leave, whole blueberry, and a amalgamation of herbs sauce that tied the dish together is simply to die for. All us never thought that a vegetarian could be this delicious. A pil pil is a sauce originating in the Basque country, made from oil in which the fish has been cooked in garlic and guindillas (small hot peppers). The pil pil sauce reflects the Basque origins which was highlighted by a delicate sweet lump of onions, which really brought the cod alive with flavor. 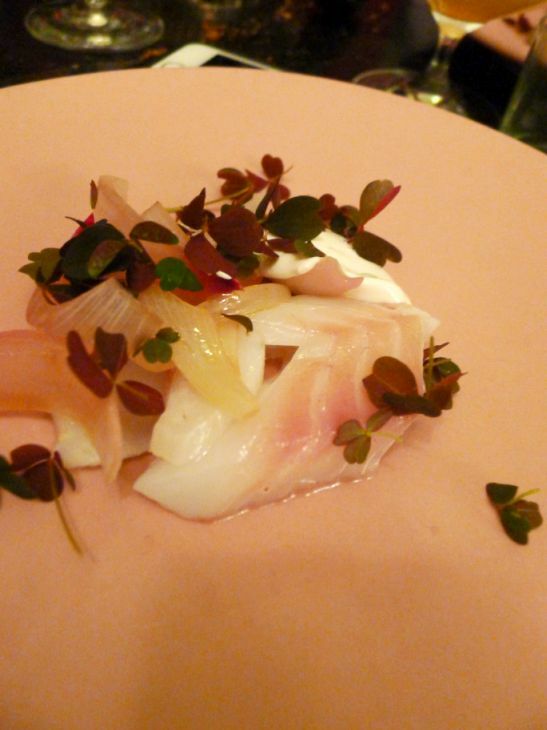 The cod was really incredible in this dish, in between cooked and raw, nice consistency, fresh, sweet and very aromatic. 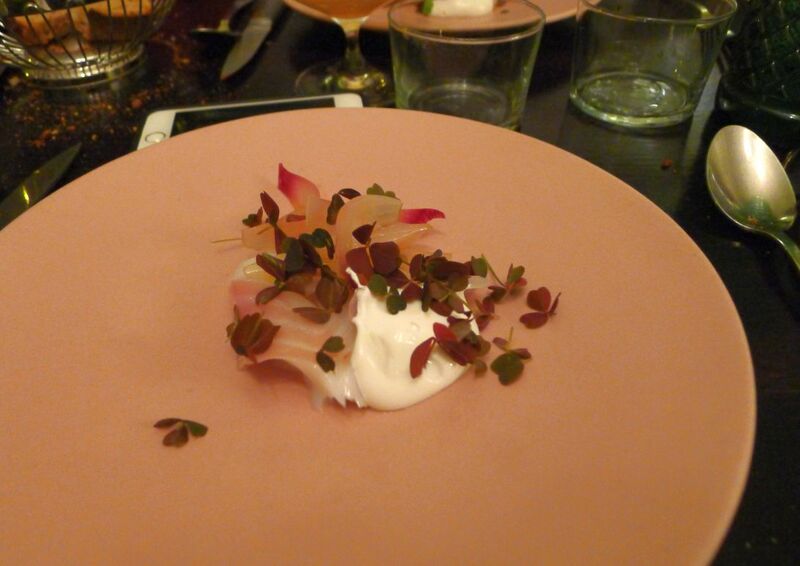 Pretty incredible dish. 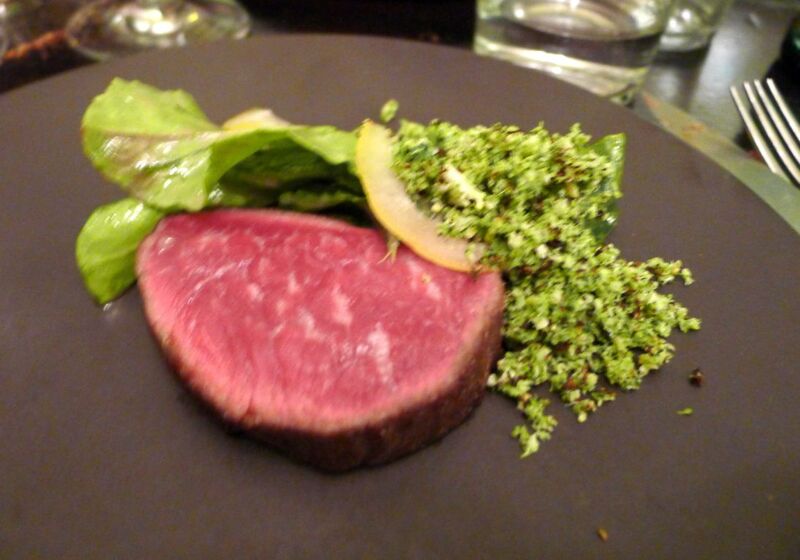 Boeuf mature, roquette, brocoli - Aged beef, arugula, broccoli. The beef was seared on the outside and served almost raw just the way we liked it. 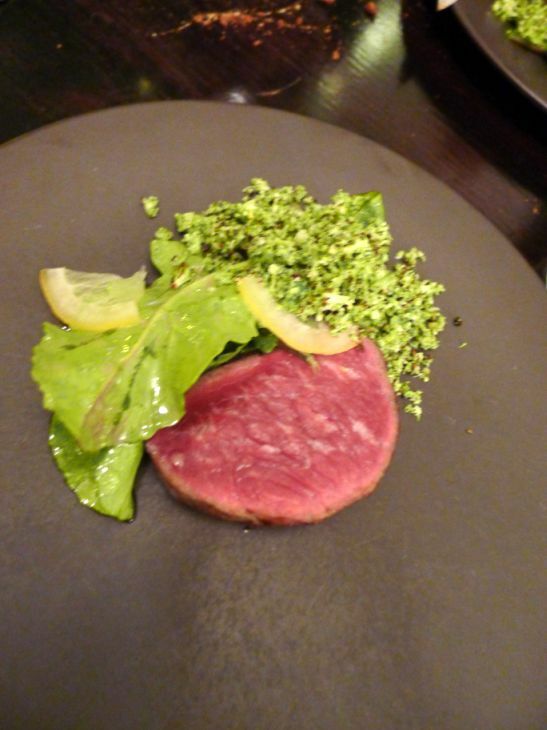 The beef was tender, flavorful, but the taste of arugula was so pronounced that it muted the taste of the beef. Basically, you should eat the beef first to enjoy all the flavor and then eat the vegetable separately. 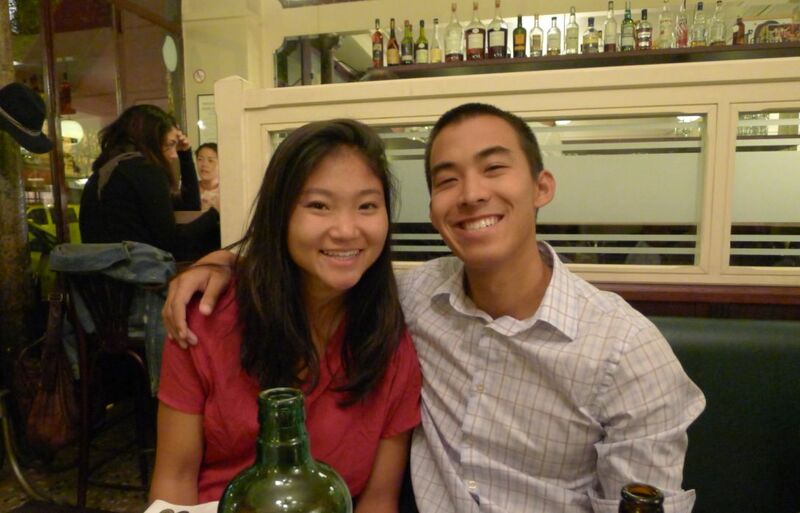 Kevin and Hoa opted for an assorted cheese platter instead of dessert. 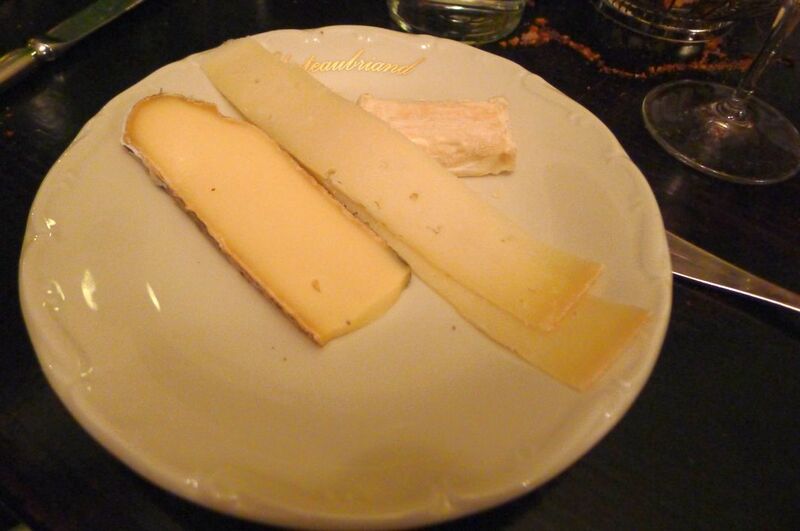 Cheese: three types: goat, cow and sheep presented with bread. Kristie and I we choose to have dessert. 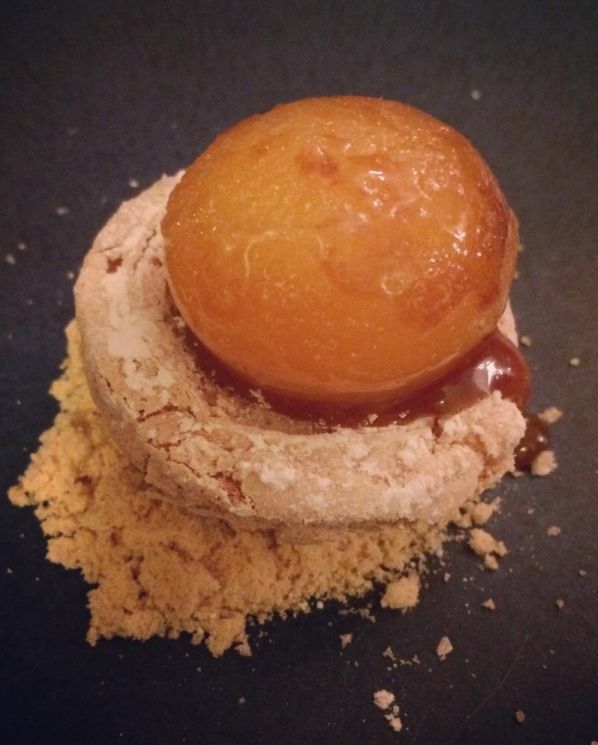 The final course was the chef's version of "Tocino del Cielo" (bacon of heaven) with an egg yolk covered in a crisp layer of caramel sitting on top of a meringue. 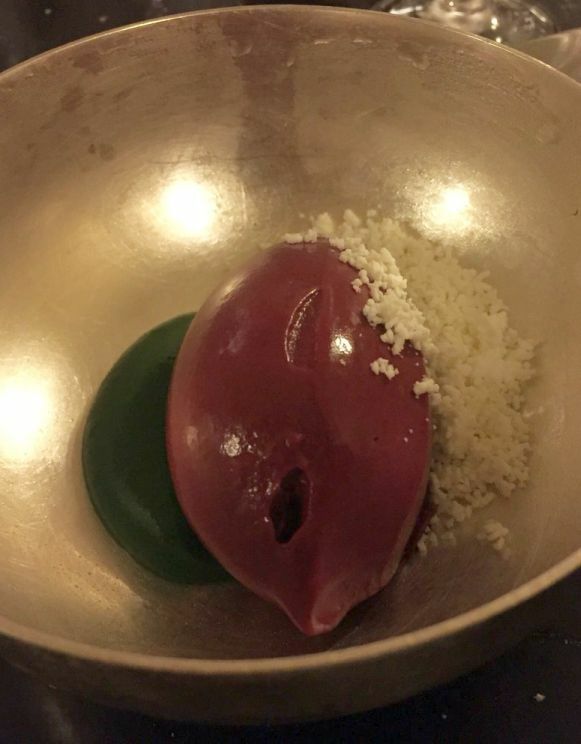 We were told to that this dessert should be eaten and a single bite and this Le Chateaubriand signature dessert. 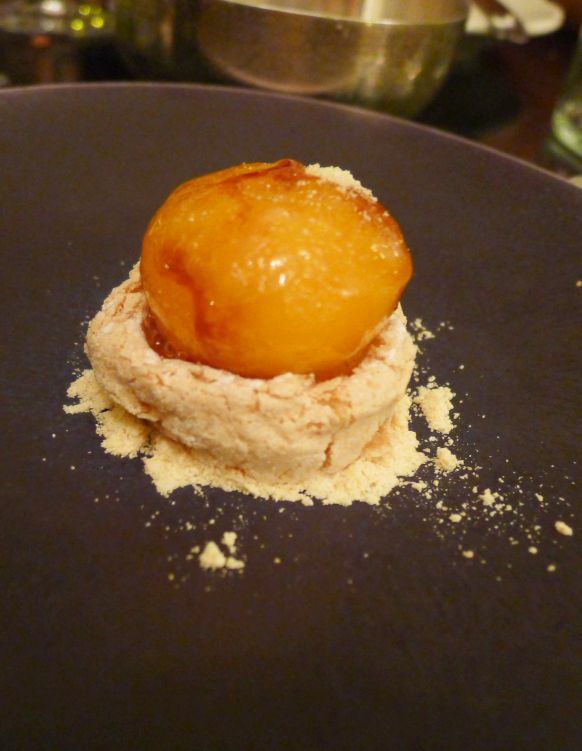 It is a tasty dessert with candied egg yolk that oozed in your mouth. 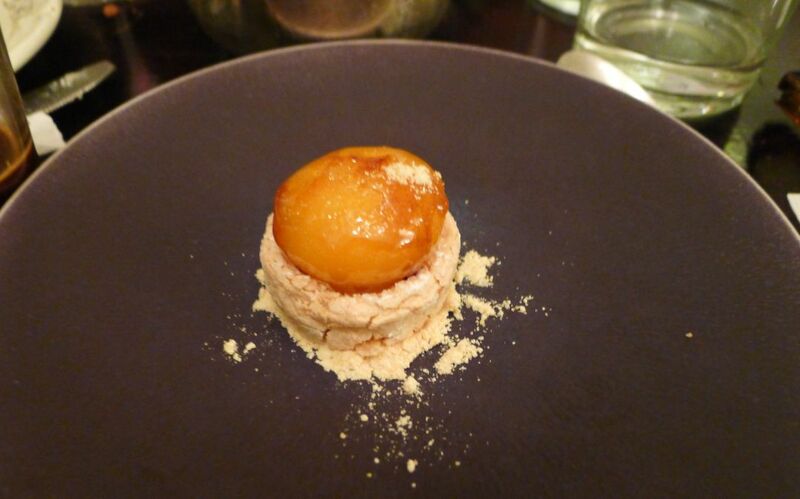 It was a perfect balance of sweetness from the caramel, saltiness from the egg, and crunchiness from the meringue. Tasty, interesting, and pretty unique. 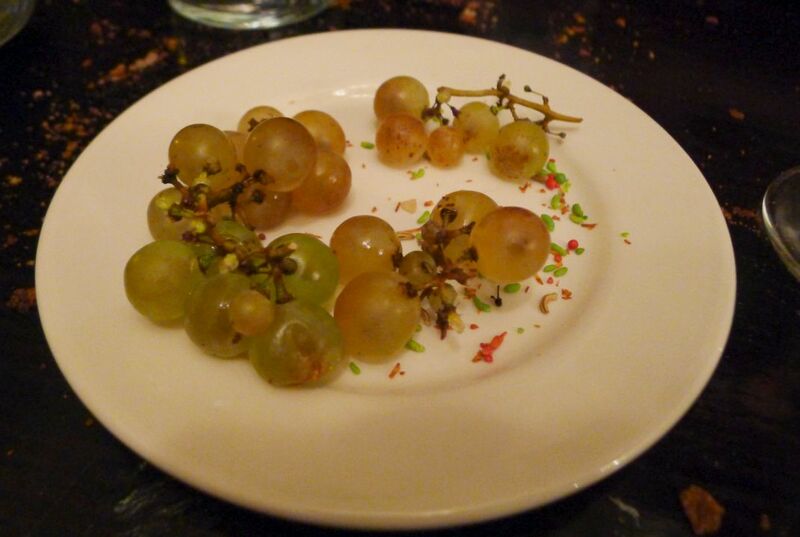 A plate of grapes with a mixtures of spices was served at the end of our meal. 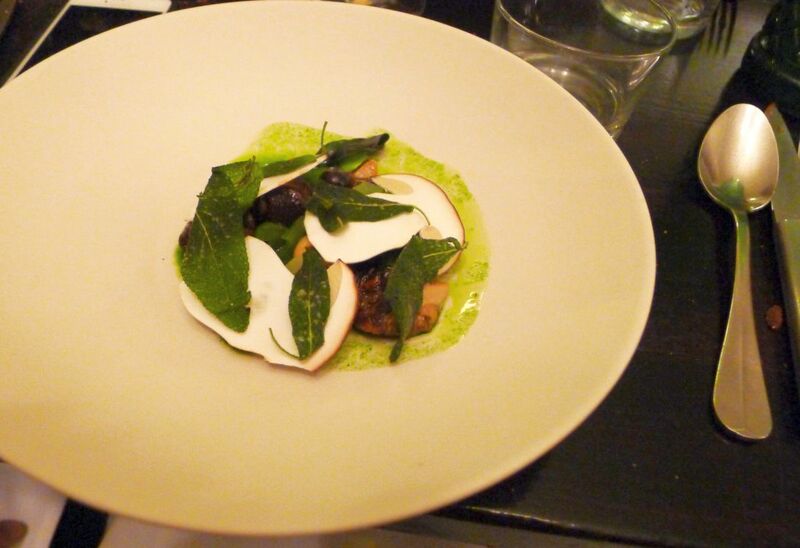 Overall, an excellent meal with bold and delicate flavors. Service is far from being close to three star restaurant but they did a decent job at taking care of their customers. Inaki himself says it best, “I just hope people can understand what I am trying to accomplish each time, and that by having fewer and fewer flavors, the essential becomes more distinct”, the food doesn’t have too many components, everything on the plate is there for a reason, and the diner doesn’t have to scratch his or her head trying to tie it all together." 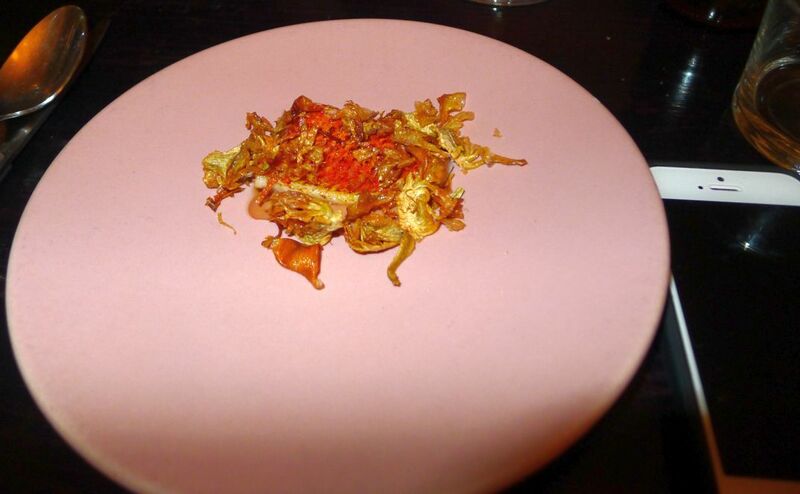 Inaki dishes looks unassuming and simple but it is only after you’ve dug in and you realized how delicious it is. With each bite you quickly realize that even within the simplicity, there is a tremendous amount of complexity beneath the surface. 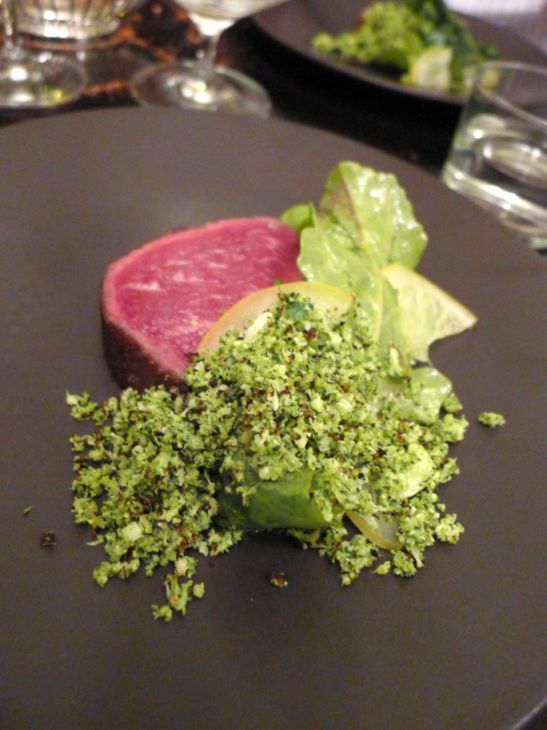 I am so glad I had a chance to eat at Le Chateaubriand and it turned out to be our best meal in Paris.